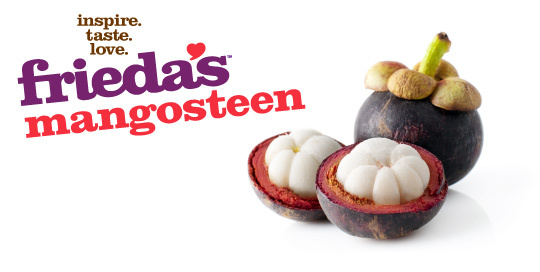 Primarily grown in Thailand and Southeast Asia, the Mangosteen is a special little fruit about the size of a plum with a firm purple shell and a beautiful creamy-white inner flesh that is separated into citrus-like segments. The flesh has a mouthwatering, silky smooth juicy texture — similar to a lychee. The flavor is a tropical combination of ripe peach, strawberry and citrus. Best enjoyed fresh. To open, hold the fruit stem-end up and score around the “equator” of the shell with a paring knife, then give the fruit a twist. Using a fork, enjoy the segments and discard skin. The largest segment may have inedible seed–simply eat around it. The fruit should give a little to pressure on the shell. A very hard shell indicates over-ripeness. It is normal to find some yellow sap on the fruit. Keep refrigerated and use within 3 days of purchase.